Mohali, Nov 21: Khalsa Warriors and United Singhs are all set bring down the curtain on the inaugural Wave World Kabaddi League with the Grand Finale scheduled for Saturday evening. After four months of exciting League matches four teams qualified for the semi-finals, from which Khalsa Warriors and United Singhs earned the right to battle it out for the Big Prize. The two will face off on Saturday, November 22 at the International Hockey Stadium at Mohali. The final will be preceded by the third place play-off between the losing semi-finalists, California Eagles and Vancouver Lions. Mr. Sukhbir Singh Badal, Deputy Chief Minister of Punjab and President Governing Council, Wave World Kabaddi League will be the Chief Guest for the occasion. The Kabaddi action will be complimented with breathtaking performances by famous Punjabi singer Hans Raj Hans and star cast of Punjabi movie ‘Happy Go Lucky’- Amrinder Gill and Gurpreet Guggi. The winners of the final will pick up a whopping prize money of Rs. 1.8 crores and runners-up will settle for Rs. 90 lakhs. The other awards for the evening will be third place prize of Rs. 45 lakhs and Rs. 21 lakhs for the fourth placed team. The Best Raider and Best Stoppers awards will fetch the individuals Rs. 1 lakh each. The league has witnessed a soaring TV viewership of 40 million viewers and 31 million viewers across the Hindi speaking regions along with amazing fan following in the stadia and social media will drive the final phase of Wave WKL to newer heights in the action-packed final stage. The Wave WKL has travelled through seven different cities in two continents – Europe and Asia. 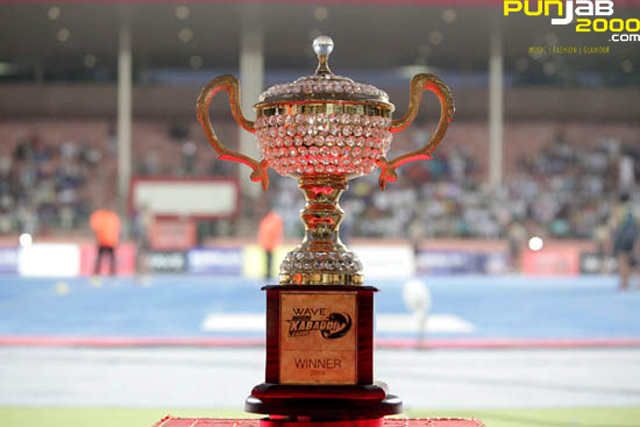 The Wave WKL matches have so far been held in spectacular locations like O2 Arena, London; LG Arena, Birmingham; Indira Gandhi Indoor Stadium New Delhi; PAU Grounds in Ludhiana, Rajindra College Bathinda, Surjit Hockey Stadium Jalandhar, Guru Nanak Dev University Hockey Stadium, Amritsar, Hockey Stadium, Mohali and Aishbag Hockey Stadium in Bhopal. The Wave WKL matches are broadcasted on Sony Six, the official broadcasting partner for the league in India. PTC is the international TV Broadcast partner for Wave WKL across markets of North America, South America, United Kingdom and Canada. You Tube is the official global streaming partner of Wave WKL. The Wave WKL was inaugurated in UK, where matches were held in London and Birmingham. The matches have since then been held in New Delhi and in various cities in Punjab. The Punjab cities, which have hosted the matches, are: Ludhiana, Bathinda, Jalandhar, Mohali and Amritsar. The Commissioner of the Wave WKL is former India hockey captain, Pargat Singh, who has played for India at three Olympic Games and been the captain in two of them. The Chief Executive Officer (CEO) of the Wave WKL is Raman Raheja, a Sports and Entertainment Management professional with more than two decades of experience in Sport and Entertainment industries. The organization is committed towards driving mileage for a holistic ecosystem where fans transcend nationalities and actively participate amongst themselves, their teams and the league partners, thus becoming a truly global audience. The society respects the rich tradition of Kabaddi and would simultaneously focus on making the sport contemporary.